SEP 2.0 is getting bigger - New agenda, new members, new programs. The open innovation platform Startup Europe Partnership, led by Mind the Bridge and launched at World Economic Forum in Davos in 2014, is getting bigger and bigger. 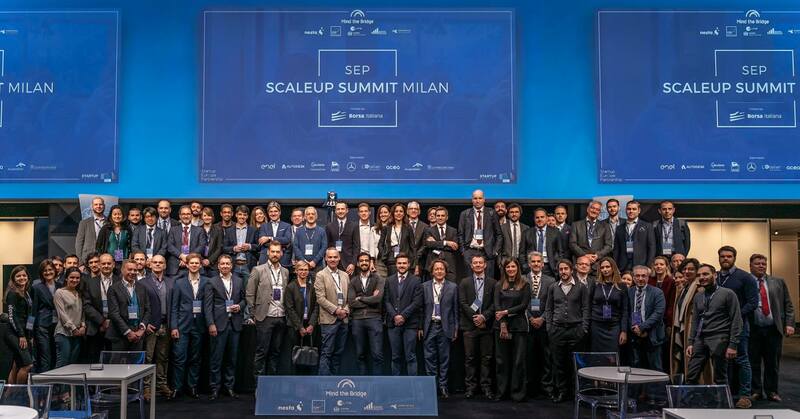 At last SEP Scaleup Summit, hosted by Borsa Italiana in Milan beginning of March, some news have been unveiled. Unveiled the 2019 Agenda – From the Borsa Italiana in Milan to the London Stock Exchange (June 21st-22nd), Boerse Stuttgart (October 24th-25th) and then Bolsa de Madrid (December 10th-11th) with extra stops in 2 of the most important tech hubs of the world: Israel (early June) and San Francisco (end of September). The goal is to provide attending corporates with dedicated scouting services and the opportunity to meet the best international scaleups. In the meantime, Startup Europe Platform gets new corporate members – After Telefónica, BBVA, Orange, Autodesk, Enel, Acciona and Unipol, SEP welcomes Eni and ACEA. Within SEP, Eni aims at identifying innovative digital solutions able to contribute and reach decarbonization goals, spreading circular economy models and eco-sustainable behaviours as well as further improving the safety of installations and workplaces. ACEA, for its part, will focus on innovation trends in key economic segments like energy, construction and smart cities. Deal making – Approximately 50 international companies and over 60 scaleups got together at the Italian Stock Exchange: over 300 one-to-one meetings that will hopefully lead to commercial and strategic deals. Three deals have been announced at the opening of the last Scaleup Summit and they were made out of conversations started during the 2018 edition in Milan: Mediolanum has chosen to adopt the risk management model platform of the Belgian company Yields.io, Acciona has chosen the blockchain platform of the Catalan scaleup FlexiDAO to track its renewable energies, while the Cornaglia Group has finalized a first Industry 4.0 project with Alleantia. Open innovation is increasingly becoming central to corporate strategies. Today, 88% of large international companies have an open innovation unit and a top figure (CIO, Chief Innovation Officer, or CDO, Chief Digital Officer) as data from Mind the Bridge research shows. What about Italy? Preliminary data from Mind the Bridge indicates that even Italian companies are moving in this direction, albeit more slowly. 75% of large companies, 50% of mid-size companies, and less than a quarter among small companies have an open innovation unit. What are the most startup-friendly companies in Europe? The international call has officially started to name companies that are more concretely active in open innovation. The process to choose the 36 Corporate Startup Stars of 2019 managed by Mind the Bridge and Nesta under the patronage of the European Commission has started. The winners will be announced in December in Madrid during the SEP Scaleup Summit. Samsung Electronics, KPN and Sodexo got to the podium last year. From SEP to ELITE – The SEP Scaleup Summits are hosted by the main European stock exchanges with the declared objective of opening up the world of tech startups to capital market. In order to make it happen, 20 international scaleups among the ones invited to attend the SEP Scaleup Summits, will join the London Stock Exchange ELITE program. This program aims at preparing companies get structured to grow and eventually to go public. In Milan the first 4 new ELITE scaleups were announced: Glassup, q-bot, Alleantia, and Profumeriaweb. An International platform involving local clusters – The Summit is by design an international deal making platform. Alberto Onetti, Chairman of Mind the Bridge, commented at the Summit opening: “It’s very rare that you can find solutions to your problems close home.” Thanks to the partnership with Confindustria Emilia, a group of companies from Emilia-Romagna have been invited to join the Summits in Milan and in London with the aim of get exposed to innovative companies from all over Europe. Let’s make cities more innovative (not just smart) – A session of the Summit was dedicated to presenting innovative solutions for cities deriving from the collaboration between large companies – such as ArcelorMittal and ACCIONA – and startups – such as Baragaño bhome (steel modular architecture) and D-Shape (solutions for 3D printing, cement). Some of the cities participating in the new European initiative “StartupCity Europe Partnership”, including Valencia, Lyon, Turin, attended the event.